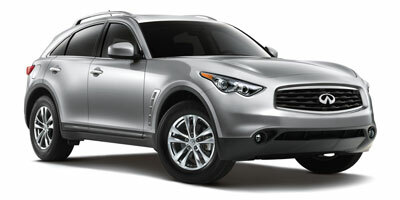 The 2009 Infiniti FX35 is in a competitive class of sport-oriented Premium Luxury SUVs. Swathed in chrome finish and leather upholstery, the five-passenger FX holds its own in both performance and style against its well-matched competition, all while delivering some technological firsts for its segment. One such feature is the Around View Monitor (AVM), a system that uses four wide-angle cameras to display the FX’s complete surroundings on the navigation screen, thus reducing blind spots while parking and driving. The re-tuned V-6 engine now produces 303 horsepower, 28 more than the previous model, and its more dynamic suspension and tight handling delivers a solid drive. With a cutting-edge exterior design and new, innovative features, the FX35 will no doubt catch your eye. A more rigid body frame decreases the time steering input takes to get to the axles, making the new FX feel more nimble around corners than the outgoing model. A sleek and aggressive silhouette has made the SUV look as engaging as it drives. Standard “self-healingâ€ paint contains an elastic resin in the clear topcoat that fills in fine scratches when exposed to sunlight, meaning you’ll be able to move on from your fear of shopping carts, tight parking spots and, yikes, kids. With all the new technology involved in this refresh, the buttons to trigger these features are in unintuitive locations, like by the driver’s left knee or to the side of the instrument panel. Buyers may miss a third row of seats, something that similar-sized rivals like the Audi Q7 have. Its aggressive styling and polarizing exterior design won’t be for everyone either. Though it is the smaller of the two FX engines (the FX50 has a 5.0-liter V-8), the FX35 has more than enough power for most consumers. This 303 horsepower car will easily zoom past dawdlers in the slow lane, and the ride is slightly quieter than the beefy V-8, meaning the noise from your exhaust won't wake the neighbors. Handling has been improved with a new double-wishbone suspension, and steering is responsive and tight. The four wheels are driven by a seven-speed automatic transmission. A standard manual mode with paddle shifters holds the revs at redline longer than when in full automatic mode, creating a significantly more interactive element to the drive. The rear-wheel drive FX35 is available with a 3.5-liter DOHC V-6 engine, featured in Infiniti’s EX35 and G35 models, and produces 303 horsepower and 262 lb-ft of torque, compared to the 2008’s 275 horsepower and 268 lb-ft of torque. The seven-gear automatic transmission makes for a more fuel-efficient drive than the previous five-speed. Infiniti has tuned the shift points to maintain a reserve of torque so that you’ll really get going when the throttle is punched, which we feel will be often. The FX willingly partakes in the luxury segment’s affinity for optional packages. A premium package equips the car with manual front seat coolers and heaters, Bluetooth capability, an iPod interface and quilted leather seats. The navigation package with a voice recognition GPS system, XM radio with NavTraffic and compact flash drive are also a smart choice for this SUV. Some standard features for the FX35 include a 300-watt Bose audio system with steering wheel-based volume controls, power seats, doors and windows, a sunroof, keyless ignition and rearview camera. Acronyms abound in what Infiniti calls the “Safety Shieldâ€: a group of technology-heavy features designed to keep the driver protected from the unpredictability of the road. The Distance Control Assist (DCA) pushes the throttle back against your foot, warning the driver that the car in front may be getting too close for comfort. Lane Departure Prevention (LDP) will brake individual wheels to keep the car in the travel lane when it senses it drifting. The system won't, however, adjust if it senses driver input, leaving you to change lanes without the technology overriding your purposeful steering. The laser-based Intelligent Cruise Control (ICC) detects the distance in between the car in front and will slow down or accelerate when necessary without the driver having to adjust the cruise control settings. Using the car ahead as a guide, the system can actually brake until the car comes to a complete stop. The FX35 gets 16 mpg in the city and 23 mpg on the highway on the rear-wheel drive model and 16 city and 21 highway with the all-wheel drive. Compared to 2008’s model, these numbers improved by one mpg across the board, thanks in part to the seven-speed transmission. They are also in-line, or perhaps even a little better than the rest of the segment, where rivals like the V-6 Porsche Cayenne get 14 mpg city and 20 mpg highway. In the refreshed interior, the harder edges of the previous model have given way to curvier features like rounded air vents and an Infiniti dubbed "double wave" instrument panel. The sweeping roofline is hardly an indication of interior room in this low profile SUV as the occupants have 102 cubic feet of space. A good stretch awakened the FX, and the extra two inches in overall length now couple nicely with menacing headlights and functional side air vents, which reduce front-end lift in the car by letting air flow through the engine more efficiently. The deluxe touring package adds 20-inch wheels – up from the standard 18-inch - to complete the aggressive look. We think the wavy grille will raise eyebrows, but not in the good way. The FX35 starts at $40,950 in rear-wheel drive form and $42,350 for the all-wheel drive. Its V-8 wielding sibling, the FX50, will start at $56,700. A standard navigation and premium package are part of the price jump between the two models. Infiniti has priced the FX equally among heavy hitters like the Mercedes-Benz M-class which is priced at $47,250, the BMW X5 at $46,200, Acura MDX at $40,790 and Cadillac SRX at $40,060. Those looking for something beyond standard vanilla car design will receive a jolt of satisfaction from the newly refreshed FX. Both the interior and exterior styling has solidified Infiniti’s edgy look and the FX’s V-6-powered performance will plant an evil grin on any buyer’s face.